Institutions of higher education honored Wellesley faculty with honorary degrees this year. Luella LaMer Slaner Professor in Latin American Studies Marjorie and Professor of Spanish Marjorie Agosín and Professor of Sociology Peggy Levitt (pictured) were each honored with an honorary doctorate from prominent universities. Marjorie Agosín is a poet, human rights activist, scholar, and literary critic whose diverse interests focus on questions of identity, migration, and ethnicity. Her many books include Dear Anne Frank: Poems; Tapestries of Hope, Threads of Love; Ashes of Revolt: Essays on Human Rights; At the Threshold of Memory: New & Selected Poems; and Of Earth & Sea. She received the Dr. Fritz Redlich Global Mental Health and Human Rights Award from Harvard last year in recognition of the healing powers of her poetry. A recipient of the U.N. Leadership Award for Human Rights and the Gabriela Mistral Medal of Honor (for lifetime achievement) from the Chilean government, she is considered one of the foremost Latina writers in the United States today. In addition to teaching, Agosín recently published I Lived on Butterfly Hill (Atheneum), the story of a young girl who emigrates from Chile to Maine. In recognition of her pioneering and thought-provoking works, Case Western Reserve University in Cleveland, Ohio, bestowed on her an honorary doctorate of humane letters. Peggy Levitt also studies questions of migration, from the sociological angle: the relationship between a migrating people and migrating culture, the effects of migration on poverty and poverty alleviation, and how cultural institutions can partner to create new, transnational communities. In addition to her position at Wellesley, Levitt works as a research fellow at the Weatherhead Center for International Affairs and the Hauser Center for Nonprofit Organizations at Harvard, where she directs the Transnational Studies Initiative. 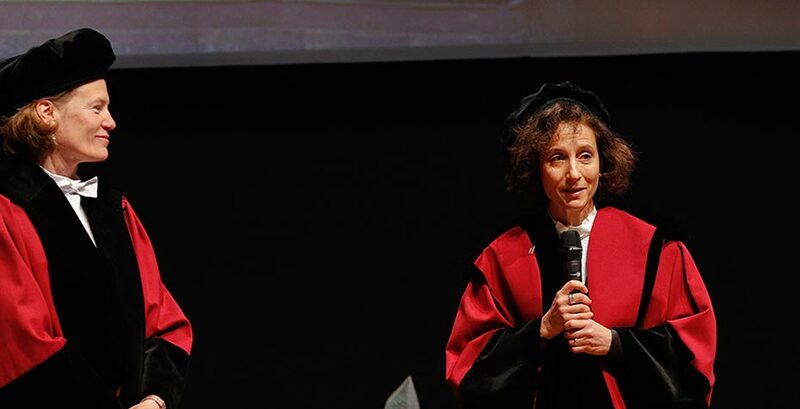 In recognition of her global thought leadership on these issues, Maastricht University in Maastricht, Netherlands, presented her with an honorary doctorate earlier this spring on the university’s birthday. In her public lecture for the occasion, Levitt spoke on “Migrating People, Migration Culture: Concepts, Methods, and Implications for Development,” sharing from her decades of expertise on new ways of understanding these important global changes. “It's a great honor to have my work understood and appreciated,” said Levitt. “It's also wonderful to be part of the interesting work being done in Maastricht.” She will continue to collaborate with the institution through the recently-created Center on Citizenship, Migration, and Development on projects regarding migration and development, and global social protection. Wellesley congratulates both professors on this recognition of their extraordinary work.